Poverty and inequality are referred to often in the (conventional and social) media. About once a week in the semester the ECON 156 lecture starts with a discussion of a relevant article in the last week’s news or other media. Students are also encouraged to send any suggestions for class discussion from things they have read recently. These sub-pages provides short notes and links on relevant items from the media, including those discussed in class in ECON 156. Sites that regularly carry content relevant to EOP include From Poverty to Power, Ideas for India, the Center for Global Development, the World Bank’s Development Impact, Let’s Talk Development and Africa Can End Poverty blogs, the Roosevelt Institute, the Guardian’s Poverty Matters blog, the WIDER Blog and the Economics that Really Matters blog run by Cornell students. The School of Life video “Why some countries are poor and others rich” is well worth listening to. Don’t miss Zalissa’s Choice, the winner of the 2015 Golden Radiator Award (the Rusty Radiator Award went to “BandAid30”). 39 cents. 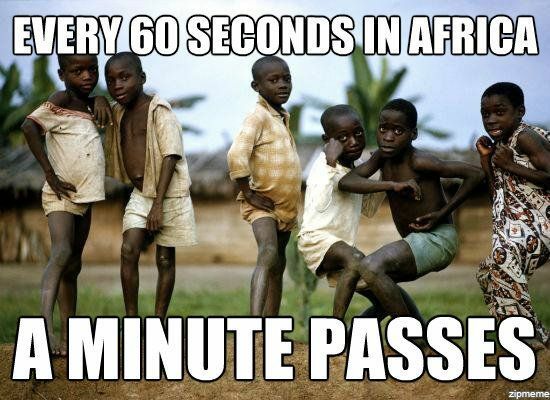 Let’s save Africa! Gone wrong. I want to be an aid worker (all from the Guardian‘s top 11 aid parodies for 2015).